Bluetooth Beacons can be placed a events to push our proximity based notifications to visitors. In addition, event organizers can receive useful insights with regard to the location of their visitors in real-time and post event data analytics. How as an Event Organiser you can make money from placing Bluetooth Beacons at strategic locations of Trade Shows? 1) Gamification: Get your visitors to go to less popular parts of the trade show. E.g. there was a scavenger hunt at the Consumer Electronics Show (CES) in 2014 encouraging visitors to explore all parts of the hall. 2) Hassle Free Registration: No long queues E.g. Visitor can download the mobile app prior to the event and on the actual day, proceed straight to the entrance. Event organizers will automatically receive their information as they approach the entrance. 3) Enhanced Networking: Using App to guide around E.g. For example, during the Cannes Lion Film Festival 2014, the ‘Around Me’ feature in the official event app, enabled visitors to message and meet people around them. 4) Sponsorship E.g. when a user walks pass a certain area in the event hall, they receive a notification prompting them to come and visit the booth. 5) Navigation and Heat Mapping E.g. Beacons are a great way to navigate your visitors around the event hall. Event organizers will also receive information as to which booth was more frequently visited and data analytics after the event has ended. Click Here to Find out more on Visitor Tracking at Conferences and Pricing. 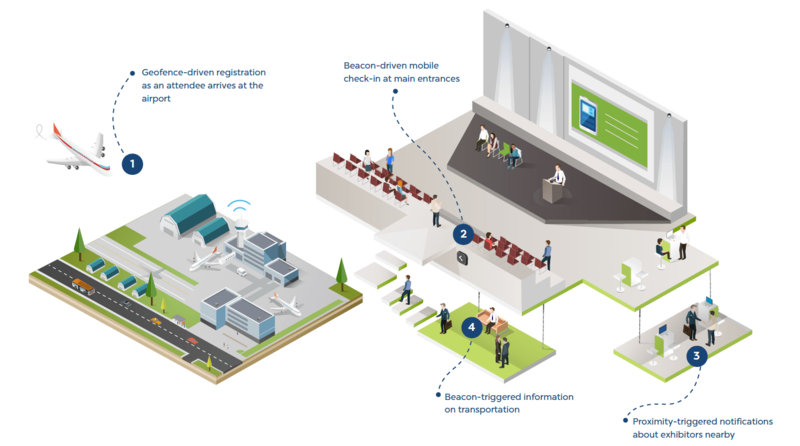 JA Security offers a number of iBeacon solutions to fit your event needs. Email info@ja-si.com or call +65 9455 5414 for more information. We provide fully customized iBeacon Solutions.